I love colour! It's one of the things that attracted me to Stampin' Up! because I loved I had so many cool things in coordinating colours. If you follow me on Pinterest, you will know that I love to pin colour combinations. I thought I'd take that one step further and introduce a weekly colour inspiration post. This isn't a challenge (but of course I would LOVE you to try out my colour combinations and let me know how you it inspired you!). I just want to share some inspiring colour combinations I have come accross and show you these in action with a card or two. This weeks colour inspiration is Pink Pirouette, Pool Party and Gold on this first card. It meant I could use the YUMMY Gold Bakers Twine, Watercolour Wonder Washi Tape and Sequin Trim. Love how those sequins can be placed individually as well too. This gives an extra sparkle to a card. I created the layered shape in the centre by using a combination of Oval Framelit, Banner Punch (free during Saleabration with a $90 order) and one of the shapes in the Apothecary Accents Framelits. Here's another card using the same colour combination. I am still in love with Chevrons and loved using the Chevron embossing folder and the Chevron patterned paper (from the Subtles paper stack). The flowers on this one are from the Floral Fusion sizzlit die (just $9.50) and the greeting shape is from Apothecary Accents Framelits again. The greeting is from Regarding Dahlia's stamp set. Which is your favourite? Are you a quick and simple cardmaker or like a few extra details and texture? I'd love to hear from you and see what you create with this colour combination. To receive free projects from me each month and earn at least $50 free product, join one of my Stampin' Up! by mail Hostess Clubs. If there is anything you would like to order, you can buy Stampin' Up! products online 24/7 in my online Stampin' Up! store. I'm happy to accept phone or email orders too. Earn one of 13 free Saleabration products when you place a $90 order in one transaction before March 31st. Join the hundreds of other happy stampers who subscribe to my email newsletter to never miss a thing about Stampin' Up! Wisteria Wonder is one of my favourite Stampin' Up! colours. I used it on this birthday card to show off products you can earn for free during Saleabration in Australia up to March 31st 2014. The embossing folder (Decorative Dots embossing folder) is one of the 13 free items to choose from with a $90 order, as is the See ya Later stamp set where this greeting came from. The yummy DSP is Afternoon Picnic. You can purchase Stampin' Up! products in Australia with me either in my online store or by email. I also have Stampin' Up! clubs by mail if you are interested in receiving free projects from me each month. I made this little project for Valentines day, but it could be easily adapted to any Stampin' Up! punch and matching stamp set. Super easy and I have included the measurements below. The tag comes out to show the word 'you' and the coloured heart from Language of Love stamp set in the new Occasions seasonal catalogue. This set coordinates with a few of our punches plus new Banners Framelit Dies. My Wisteria Woner tag piece was 11.5 x 5.1cm before I punched the top using the new & totally cool Stampin' Up! Tag Topper Punch. My whisper white piece was 10cm x 12.6cm, and scored and folded at halfway accross the widest side (so at 6.3cm). I punched the full heart in the front of the whisper white piece and then pierced around the edges using the Essentials Paper Piercing Pack. Next I used one of the rolls of our 3 pack of gold washi tape patterns, over the sides and bottom (only one of those edges actually needed sealing, the rest is decoration). I then decorated the rest of the front. I stamped the Language of Love heart onto a piece of Whisper white (inked with Almost Amethyst and Elegant Eggplant sponged around the edge), which I then cut out with the full heart punch. To get this heart placed in the correct spot on the tag. place the tag in the pocket and adhere to the tag through the punched opening. Hope you like today's project. If you would like to receive three free projects from me a month, you might be interested in my Stampin' Up! Hostess Clubs which are totally by mail and email, so you can stamp in your pj's if you like! Saleabration is still on, and its a great time to place an online order. For each $90 you spend you get to choose one of 13 free gifts, including stamp sets, embellishments, paper packs and more! Click HERE (or the red button at the top of the right hand column) to access the online store (I am also happy to take email orders with payment by direct deposit or credit card). Stampin' Up! Vivid Vases - with stems! Today's card is a birthday card using Vivid Vases single stamp from the new Stampin' Up! Occasions Catalogue. I watercoloured using our Blender Pens and picking up the ink from the inside cover of the ink pads. My colours are Coastal Cabana, Wisteria Wonder, Old Olive, Strawberry Slush and Crushed Curry. I always use Stampin' Up! watercolour paper to get a great watercolour effect because the quality is really awesome. I stamped the image in Black Stazon, and used a Black Stampin' Write Marker very lightly to create some stems (to make the appearance that the vases are clear). The DSP is from Afternoon Picnic DSP pack, and I've used some Strawberry Slush ruffled ribbon to embellish. My greeting is embossed in white and is from Another Great Birthday set from the Occasions Catalogue. Check out the Vivid Vases single stamp HERE. View all the Occasions Catalogue products HERE. Choose one of 13 free gifts when you spend $90 in my online Stampin' Up! store or by phone/email between today and March 31st. Get $20 extra free products when you join up as a demonstrator (even just for yourself). That's $255 worth of whatever you choose for just $169. You can join online instantly too! Offer valid until March 31st. Get $50 extra hostess benefits with a $500 order, group order or party total. Email or call me today to book your party or arrange on online, Facebook party with your friends. Offer valid until March 31st. 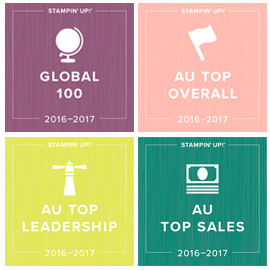 Join a Stampin' Up! by mail hostess club and get 3 free projects from me a month, as well as a minimum of $50 free goodies the month you are hostess. Taking names for the next club starting March. Great for cardmakers or Scrapbookers. 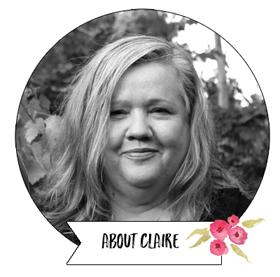 Join the many ladies who are on my email list to stay up to date with everything Stampin' Up!. It's easy to sign up and I'll never share your details. Something a little bit different for you today. A scrapbook page of my big boy over 11 years ago when he was just 8 months old. Love those curls! I've use the Stampin' Up! Sweet Sorbet DSP, which is the pack of twelve 12x12" sheets you can choose FREE with a $90 order during our Saleabration promotion which goes from today until March 31st. Here's a couple of close up photos. I did some stamping under the die cut letter, and also as a title. I cut various size flags in different patterns of DSP using Framelit Dies and the Banner Punch (another Saleabration freebie). These were adhered under the photo. I tied Soft Sky seam binding ribbon around the photo, together with gold bakers twine which is a new product in the Occasions Seasonal Catalogue. I also tied a scrap of crochet trim into the knot for a bit of extra texture. To View the New Occasions Catalogue products online, just click HERE or on the image below. If you would like to get a copy in the mail (and a copy of the Saleabration catalogue too) just contact me.